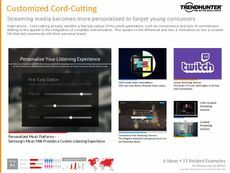 Find Better Ideas, Faster ® with a custom online media trend report, our PRO Dashboard and 80+ categories of premium trend reports. 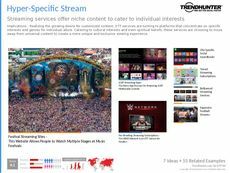 The Online Media Trend Report looks at the entertainment industry's shift from traditional to online offerings. 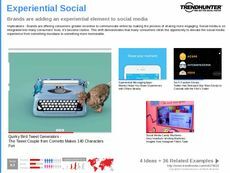 This report oversees the vast number of trends that pertain to online media, and examines the changing fields of advertising, marketing, and entertainment. 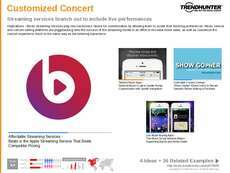 Trends in Internet streaming, online ads and interactive marketing campaigns will also be of focus. This report is ideal for those wanting to gain insight into the growing world of online media. Individuals involved in content creation, like writers, bloggers, vloggers and even traditional TV and film producers can use our report to oversee the world of online media. 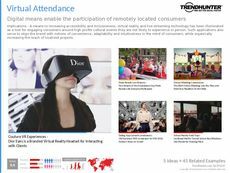 Furthermore, marketers and advertisers can utilize Trend Hunter's crowdsourced data to assess the latest media trends online. Our report will give you supercharged insight into the ever-changing online media industry, and provide countless examples of how this shift can be beneficial to your company.